edited by Pippa Norris and Alessandro Nai. June 2017. New York Oxford University Press. Recent decades have seen growing concern regarding problems of electoral integrity. The most overt malpractices used by rulers include imprisoning dissidents, harassing adversaries, coercing voters, vote-rigging counts, and even blatant disregard for the popular vote. Elsewhere minor irregularities are common, exemplified by inaccurate voter registers, maladministration of polling facilities, lack of security in absentee ballots, pro-government media bias, ballot miscounts, and gerrymandering. Serious violations of human rights that undermine electoral credibility are widely condemned by domestic observers and the international community. Recent protests about integrity have mobilized in countries as diverse as Russia, Mexico, and Egypt. However, long-standing democracies are far from immune to these ills; past problems include the notorious hanging chads in Florida in 2000 and more recent accusations of voter fraud and voter suppression during the Obama-Romney contest. When problems come to light, however, is anyone held to account and are effective remedies implemented? In response to these developments, there have been growing attempts to analyze flaws in electoral integrity and transparency using systematic data from cross-national time-series, forensic analysis, field experiments, case studies, and new instruments monitoring mass and elite perceptions of malpractices. This volume collects essays from international experts who evaluate the robustness, conceptual validity, and reliability of the growing body of evidence. The essays compare alternative approaches and apply these methods to evaluate the quality of elections in several areas, including the United States, Sub-Saharan Africa, and Latin America. 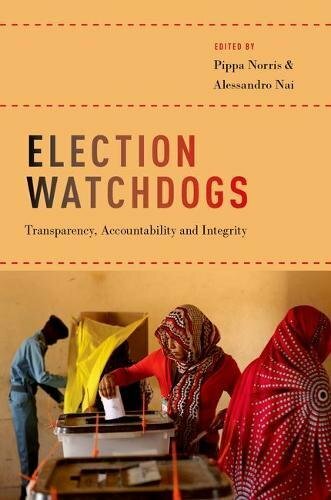 Election Watchdogs:Transparency, Accountability and Integrity presents new insights into the importance of diverse actors who promote electoral transparency, accountability, and ultimately the integrity of electoral governance.